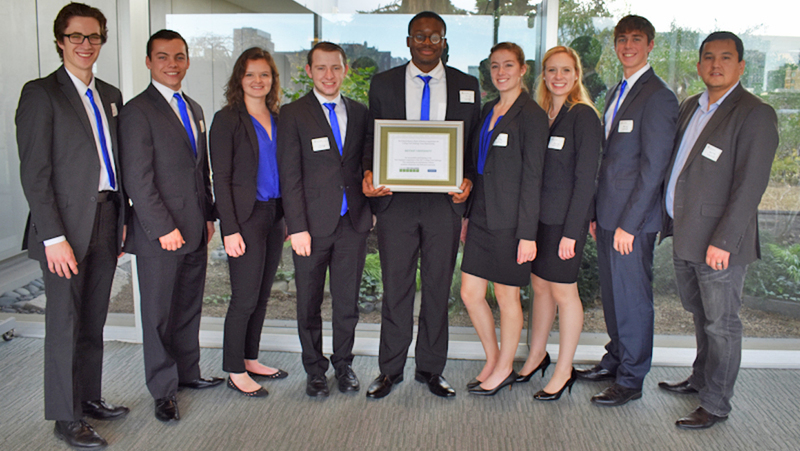 The Bryant Fed Challenge Team (from left): Trevor Perron '18, Timothy Coletta '18, Bryanna Seefeldt '18, Ryan McKenzie '18, Soala Ekine '19, Elizabeth Willmonton '18, Eva Nesline '20, Mark Dyer '20, and advisor Associate Professor of Economics Aziz Berdiev, Ph.D.
Over the course of the year, Bryant students have competed successfully – and won – against Ivy League schools and other avid competitors in regional, national, and international academic competitions. In these challenges, student teams must apply knowledge from the classroom to develop creative solutions for real-world scenarios that organizations face. Such competitions require a mastery of course concepts and theories, sharp time management, and spot-on presentation skills. Such competitions require a mastery of course concepts and theories, sharp time management, and spot-on presentation skills. Solutions are evaluated by panels of judges – experienced professionals and renowned C-suite executives – who make students run through a series of in-depth question-and-answer sessions before reaching the winner’s circle. These high-caliber academic competitions are part of the innovative applied-learning experience Bryant offers students, so that they’re well-prepared for the race ahead. College Fed Challenge – Boston: Bryant competed against schools from around New England, coming in second to Harvard and ahead of Yale, University of Vermont, and Middlebury College. The challenge was held at the Federal Reserve Bank of Boston, where teams had to present an overview of the current state of the economy, provide an economic forecast, and issue well-supported monetary policy recommendations. Team: Timothy Coletta, Mark Dyer, Soala Ekine, Ryan McKenzie, Eva Nesline, Trevor Perron, Bryanna Seefeldt, and Elizabeth Willmonton. The faculty advisor for this year’s team was Associate Professor of Economics Aziz Berdiev, Ph.D.
GAME Forum: At the Global Asset Management Education (GAME) Forum, Bryant’s Archway Investment Fund won first prize in the category of multi-asset portfolios in the student-managed portfolio competition. The team held its own against over 75 universities, including international teams. Team: The Archway Investment Fund is led by our Archway students. The faculty advisor for this year’s competition was Professor of Finance Asli Ascioglu, Ph.D.
DataFest: At this contest, held regionally by the American Statistical Association, the Bryant team won the Best Insight Award and placed second for Best Visualization, competing against Bridgewater State University, Stonehill College, and UMASS-Dartmouth. Teams had 48 hours to analyze a large data set provided by Indeed.com and build a predictive model of success for job postings. Team: Best Insight - Rachel Cardarelli, Michael Jarosz, Taylor McKinley, Jonathan Ormsbee, and Tammy Yu. 2nd for Best Visualization - Ryan Brown, Edward Golas, Michael Gough, Bridget Healy, Anthony Pasquarelli, and Cole Sussmeier. The faculty advisors for this year’s team were Assistant Professor of Mathematics Alicia Lamere and Assistant Professor of Mathematics Son Nguyen, Ph.D.
ARCHIBUS Asset Management Case Competition: At this year’s competition organized by Northeastern University, Bryant placed first, with Northeastern University and Bentley University taking second and third place. Teams had to prepare a fleet replacement plan for light- and heavy -rail vehicles and implement an integrated data strategy for the Massachusetts Bay Transportation Authority. Team: Kayla Lapinski-Goding, Liam Theis, and Ryan Harris. The faculty advisor for this year’s team was Professor of Information Systems and Analytics Suhong Li, Ph.D.
National Financial Plan Competition: Victoria Albanese '18, won this year's National Financial Plan Competition, held by the International Association of Registered Financial Consultants (IARFC). She competed against 80 other schools to claim first prize. Participants were given a fictional case study—an overview of family’s financial picture—and asked to produce a financial plan for the family. Lecturer in Finance Mara Derderian was Albanese's advisor.